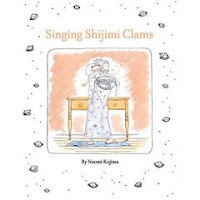 Singing Shijimi Clams by Naomi Kojima. Copy supplied by publisher, Kane/Miller. Originally published in Japan. The Plot: A witch takes home some shijimi clams to cook for supper; but when they sing, she cannot bring herself to cook them. It changes her life. The Good: I like the language: "Once upon a time, there lived a witch. When she was younger, she was a mean and feisty witch, and she liked nothing better than making fun of people and picking fights. But, now, perhaps because she was older, her sparks were gone and she was simply miserable." Right away, you have a picture of who she was, and who she is. What is this about? Well, I think it's a story about a happy retirement; a bit odd to look at a children's book that way, I guess, but that's how it struck me. Because the witch moves with the clams to the beach and enjoys the rest of her days by the sea. The first pictures shows the witch, alone in a city, bundled up, carrying her groceries; the last picture shows a happier witch, relaxing in the sun, surrounded by her cat and the singing clams. I really liked the illustrations; simple black and white, they add to the story. Between this and Charlotte's Web, kids will want to be vegetarians. The Edge of the Forest review. Kane/ Miller Play Pages (pdf). Here and There Japan blog with photos of Shijimi Clams plus a review plus some photos of the author. Jen Robinson's Book Page review. Would you mind submitting this to the Picture Book Carnival I started?